Sales quoting app gives you the opportunity to manage your quoting process using your mobile devices. Be it a tablet or smartphone, now you can use any Internet-enabled mobile device to create quotes. It enables you to manage your business smartly and take faster decisions. These apps run on both iOS and Android operating system. Create and Send Quotes from Anywhere Whether you want to browse, create or customize a sales quote, it can be done from anywhere. You are no longer dependent on your office PCs to create quotes. As long as your mobile device is connected to the Internet, you can handle your quoting process from anywhere irrespective of time and location. You can create electronic quotes right from your smartphones and tablets. 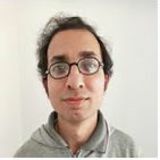 For instance, you can access your IT product catalog, customer contact etc., via mobile apps and create some of the most impressive quotes on the go. Respond Quickly As aforementioned, with mobile sales quoting apps, you are no longer tied to the office for any quote-related activity. No matter where you are, mobile quoting apps allow you to connect with your business process in seconds. So as soon as you receive a request for quote, you can instantly respond to it. You get the opportunity to create quotes then and there. You respond to quote requests immediately, which can have a positive impact on closing the sale. Save Money Mobile quoting apps provide a smarter way to communicate with your customers. You donâ&#x20AC;&#x2122;t have to spend time and money in the tedious task of printing quotes. No longer handling fax machines to get quote confirmation. If your customers have installed the app, they too can receive the quote instantly on their mobile phones. Boost Sales Performance The flexibility to generate sales quotes on-the-go will have a positive impact on sales performance. From responding to RFQs immediately to generating higher number of quotes, Mobile Sales Quoting apps can certainly help to boost sales productivity. The cloud-based mobility will allow you to close sales faster and interact with greater number of prospects. 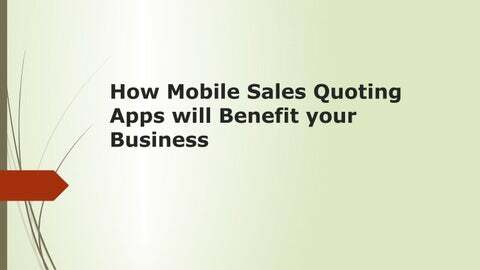 So, if you want to improve quote to conversion rate and rev up your sales result, make sure to empower your sales team with mobile quoting app. Moreover, your team can also access various sales reports and keep a track of companyâ&#x20AC;&#x2122;s performance on the fly.